Michael Ransom is back! This time around, he’s played by Brent Huff, and he really has his hands full for this particular adventure. His old Major in Vietnam, Vic Jenkins (Harris) has been kidnapped, and his captors want ten million dollars in diamonds in return for his release. 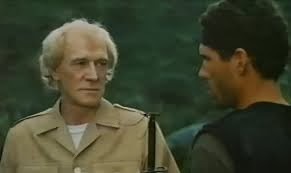 The baddie doing all the dirty work representing the terrorists who not only kidnap people, but have a large heroin-making facility, is named Kramet (Davidson). He wears a white suit in the dead of summer and has an army of ninjas backing him up wherever he goes. Soon, Ransom ends up teaming up with local tavern owner Rosanna Boom (Stavin) and CIA guy Kelly Sellers (Vanni) (who is coming up with these names?) - to ultimately shut down the drugs operation, run by the nefarious Huan To (Diaz, because this movie was shot in the Philippines) and save Jenkins, but some twists and turns might say otherwise. Will Ransom pay the ransom for Jenkins? Find out today! While Strike Commando 2 has some good moments, overall we prefer the first entry in this two-part series. It must have been tough for Huff to fill the shoes of Reb Brown, and he even tries his hand at a Reb-style scream, or, Reb-el yell as we call it, towards the end of the movie. While it would have been a perfectly serviceable scream in its own right, compared to the master Reb, it falls short. But the main problem is that there are too many “wacky” musical stings, which highlight some attempted comedy. Usually this comes in the form of the typical bickering between Brent Huff and Stavin, who plays the stereotype “nagging woman” role. That is, until they can learn to get along. Adding some loopy clarinets and silent movie-style sped-up fights detract from the intensity the movie should have. But there are plenty of positives to be found as well: many high-quality explosions are on show, and of course the main victims of these blow-ups are huts. There is some funny dubbing and some unintentional “laffs” as well. Naturally, there is the prerequisite torture scene, and in this jungle, many guard towers fall, or, poor unfortunate watchmen fall out of them. And lest we forget Richard Harris, of Richard Harris fame, whose presence here is inexplicable - but extremely welcome. Maybe the Academy Award voters held this against him and that’s why he was a nominee but never a winner? Regardless, this is Harris as fans want to see him, and, like a true professional, he doesn’t treat the material as inferior. He gives a strong, classy performance. Michael Ransom has some UNFINISHED BUSINESS - with his automatic rifle and his missile launcher. Despite some missteps, if you can see SC2, do go forth and watch. Don’t leave in a Huff, check it out if you get the chance. Also check out write-ups from our buddies, DTVC and Good Efficient Butchery! Nice review Ty. 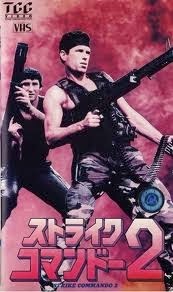 The Strike Commando movies are definitely on my radar for an exploding helicopter review. I would like to congratulate you and pass along my kudos to yet another well-written entry on this site. You need to be aware that the daily updates are quite appreciated; some sites would be lucky if they updated content weekly. You, much like many of the 90-minute works you review, far surpass that level of mediocrity. The fact that you guys only have 58 likes on Facebook is a travesty. Do you have an app? If not, I'd be the first to download it when you did. I would like to thank you again for producing such an entertaining website. It brings back memories before my wife and I had children when I could enjoy a Saturday afternoon watching B-grade movies, with a smile on my face the whole time. By the way, I don't know who wrote the final paragraph in this review, but it's gold. Exploding: Thanks! Looking forward to your write-up. There are some quality hut explosions. Joe: Thanks. We really appreciate the kind words. We don't really use Facebook as promotion anymore. Just Twitter. That would be cool to have an app. Love that the site brings back nice memories for you. Do you have any favorites you watched back in the day? Some great cheese, this. Did I send you my copy? I don't recall. Totally fun movie. You didn't send us this. We found it on Youtube. Haha. I completely agree with your review. I also watched this on Youtube, but I'm sure Brent won't get in a huff about it. I have really enjoyed your sequel February. Many thanks! A Comeuppancereviews app would probably transform my phone into a cheap Italian Terminator/Rambo rip-off that would walk around wobbling on tin-foil legs, killing my enemies at 0.6 miles per hour. You're very welcome! Happy you enjoyed Sequel Month. Coming Wednesday is Kill Week. Haha! Love that app description and your joke about Huff. Classic Robowar...every time a new review pops up, Reb Brown screams. Back in the day? I still watch them! American Ninja is permanently on my all-time list, as are many of the Cannon films. 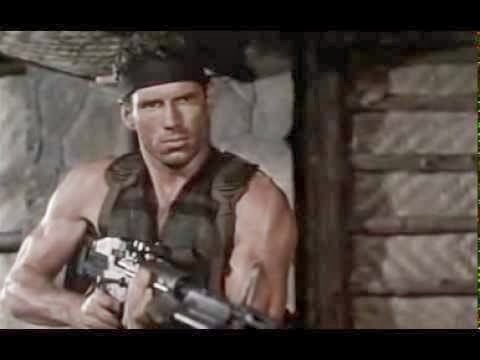 With leads like Norris, Bronson, Van-Damme, Dudikoff, and more, my list goes on and on. Awesome! All the guys you mentioned rock. Dudikoff should make a comeback. Although, as much as I'd like to see it, I'm not holding my breath. I think he'd be great in Expendables 3. How awesome would it be to actually cast him as an American ninja on a team of mercs? That would be awesome if Dudikoff made any sort of appearance in EX3. Would love to see a new American Ninja with him in it.